It is Edelux which we believe and use. , - Please note polarity! We can confirm this is the 6-75v light. Any of the SON rear lights would be most suitable. The DC hub is not the correct one for use with a dynamo hub. The correct model in black you need is SJSC part 33360. You'll need the 36cm cable option for use on your Brompton. Can This Be Hooked Up To Li Ion Without Voltage Adjustment? I have a li ion pack with 4 batteries. The voltage is a little over 7 volts. Do I have to do anything to the voltage or can the batteries be hooked directly up to the Edelux or Edelux II? If you use the Edelux II DC light, then you should be able to connect it straight up to those batteries. Which Version Edelux 2 Dc Do You Have? I am interested in the Edelux 2 DC for electric bikes. I need the 6 to 75v version. The picture you have is for the 6 to 8v version but the text description is for the 6 to 75v version. Which is correct? The description is definitely correct, the picture is the same one used across all of the different models rather than being specific to each version. This means this light is definitely the 6-75V version. What Connections Does The Edelux 2 Dc Have? I need to know what connections this has to connect to my battery. The end of the cable which would attach to the battery come as a bare end allowing you to fit whatever connection is required for your specific battery. Do you have any idea as to the amount of hours one could expect from the bulb? And do you sell replacements. I have Edelux 2 and a B&M Secula lights mounted on my Canadian made Mariposa and have been leaving both on all the time. Can you supply bulbs as I need them? 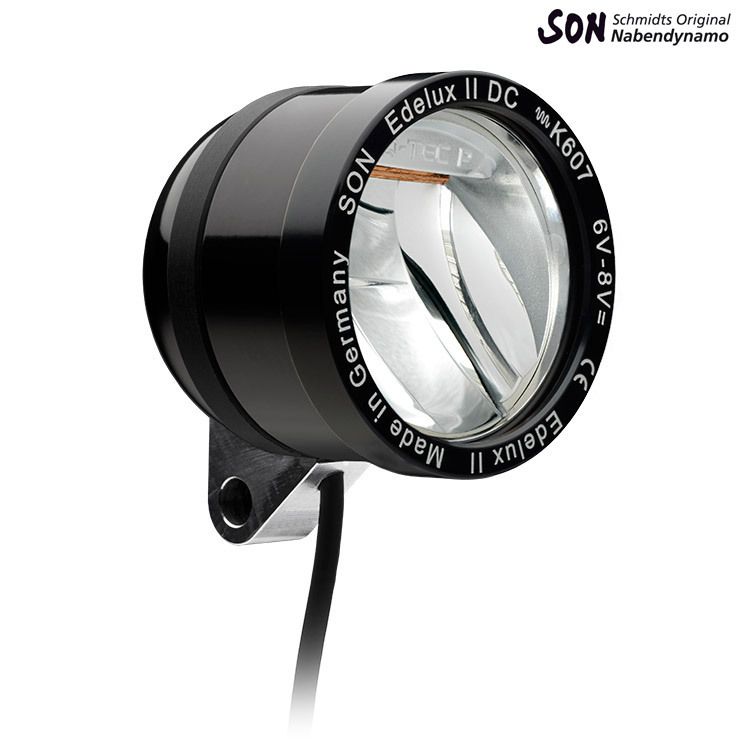 The Edelux 2 lights use LED bulbs so the bulbs are not individually replaceable. These lights can be used for a number of years without failure and if they ever do they can be sent back to Schmidt for servicing.